The UCLA Anderson Forecast today suggested California is in for an extended period of sluggish economic performance. Such sluggishness obviously makes coming to some state budget accord difficult. You can find a press release on the Forecast at http://uclaforecast.com/contents/archive/2010/media_91510_1.asp However, tucked away in each quarterly Forecast publication is an updated version of a chart, reproduced here, that gives a long-run perspective. The chart show a long-term trend rate of employment growth that lasted until about 1990. In the early 1990s, while the nation as a whole had a very mild recession, California had a major one. The year 1990 is about the time the Cold War came to an end with the dissolution of the Soviet Union. California's growth had been propelled from World War II and during the Cold War by an inflow of federal aerospace and other military-linked spending. With that push from Washington, the state could grow faster than the national average. The super-normal growth generated tax revenue that could be used for infrastructure, education, and social programs. But it went away. 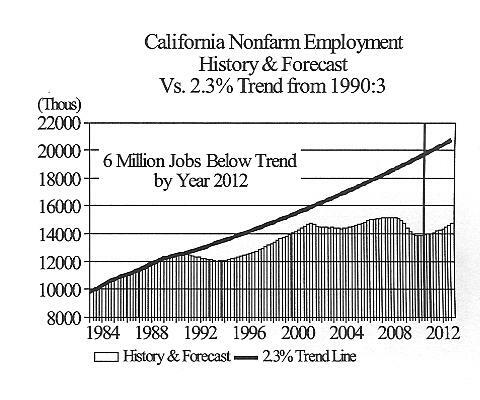 As the chart shows, although California was a center of the dot-com boom in the late 1990s and the housing bubble in the mid-2000s, its employment never went back to the old trend. 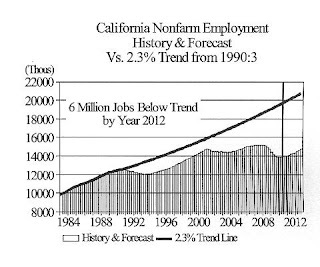 In a sense, California has never recovered from the recession of the early 1990s. And the state has never adjusted to the fiscal implications of that fact. There are other factors that play a part of California's budgetary dilemma. But this is one underlying factor that cannot be fixed with some ballot initiative, constitutional reform, or other such remedy.